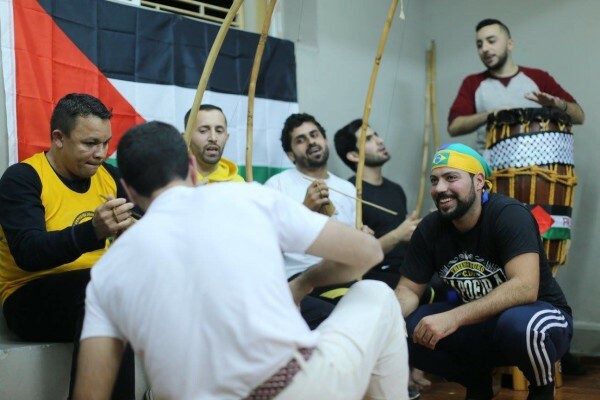 Awareness about Israel’s apartheid, colonialism and occupation against the Palestinian people is growing among capoeira players, known as capoeristas. Heeding a call from the Capoeira Freedom Collective – Palestine, Capoeira groups around the world have hosted solidarity rodas (capoeira circles) in the context of the International Day of Solidarity with the Palestinian people and the call for a “solidarity wave” by the Palestinian-led Boycott, Divestment and Sanctions (BDS) movement. “Capoeira is a traditional Afro-Brazilian martial art with a philosophy of freedom and resistance to oppression, so it is natural for capoeiristas to identify with the struggle for the Palestinian people,” says Anthony Wells, capoeirista with the Washington DC branch of the International Capoeira Angola Foundation. Mahmoud Nawajaa, from the BDS Palestinian National Committee (BNC), explains that today Capoeira is been used as a tool to normalize Israeli violations against Palestinians: “While Capoeira is a symbol of the black struggle against slavery and racism in Brazil, today there are Brazilian capoeira groups developing activities in Israel and within illegal Israeli settlements in the West Bank. Capoeira shouldn’t be used as tool to normalizeIsraeli apartheid, occupation and colonialism against the Palestinian people”. This year, Capoeira events in solidarity with Palestine took place from November 29 to December 6. Rodas were held in Ramallah, London, Oxford, Lyon, Bologna, Valencia (Spain), The Hague, Amman, Beirut, Cairo, New York, Washington and five Brazilian cities. The BNC commended the initiative by Capoeira Freedom Collective aiming to honor the legacy and ethos of Capoeira and calls for Capoeira players around the world to heed the Palestinian call for Boycotts, Divestment and Sanctions against Israel: “We expect that Capoeira groups and masters will not accept invitations for events in Israel, in its settlements or for those around the world sponsored by Israeli and complicit institutions”, says Nawajaa.